Color ink and paper set lets you experience high-quality photos. Color ink and paper set prints borderless, postcard size photos with amazing clarity. 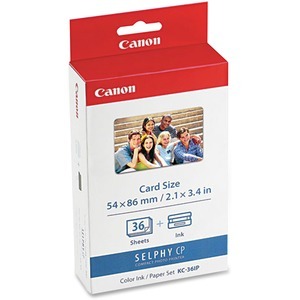 36 credit-card size prints (2-1/10" x 3-2/5") are great for smaller frames and pictures kept in your wallet or purse. Ink cartridge is designed for use in Canon PowerShot A530, Selphy CP740, CP900, CP800, CP770, CP760, CP900, CP400, CP300, CP600, CP220, CP790, CP910, CP730, CP200, CP780, CP720, SD1100, CP330 and CP100. Sheet Size 2 1/8" x 3 35/64"